Season chicken ahead of time with salt and pepper; let stand in the refrigerator until you are ready to cook. Heat the oil in a caldero or Dutch oven to medium heat. Stir in chicken and brown on each side for approximately 5 minutes, remove and store covered. 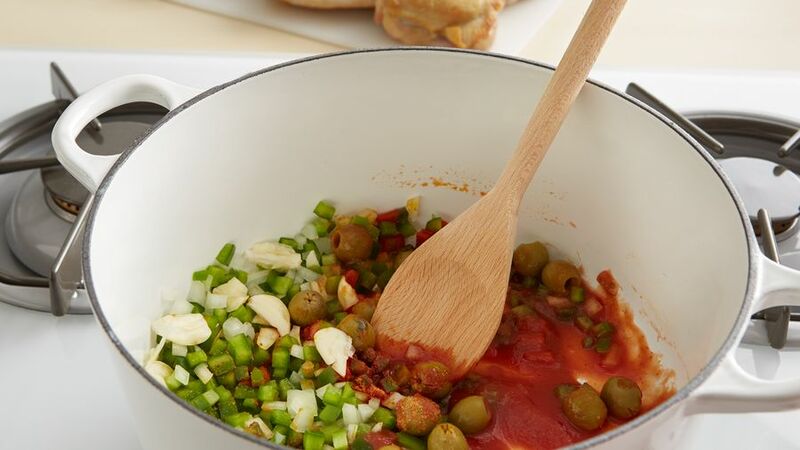 Stir in sofrito, olives, capers, season, tomato sauce, cumin and sauté for about 4 minutes at low heat. Stir in rice. Mix well with the sofrito, add water; bring to boil. When rice is drying, lower heat to the lowest and cover. Continue cooking for about 20 to 25 more minutes, until rice is completely cooked. Once cooked, stir and add the chicken. Cover; let cook for 20 more minutes. Serve with asparagus or green peas; also accompany it with a green salad or rich stewed beans. Remove skin and fat from the chicken. If the rice dries out and the grain is still raw, add two ice cubes on top of the rice, cover it with foil paper and avoid opening it during the next 15 minutes. 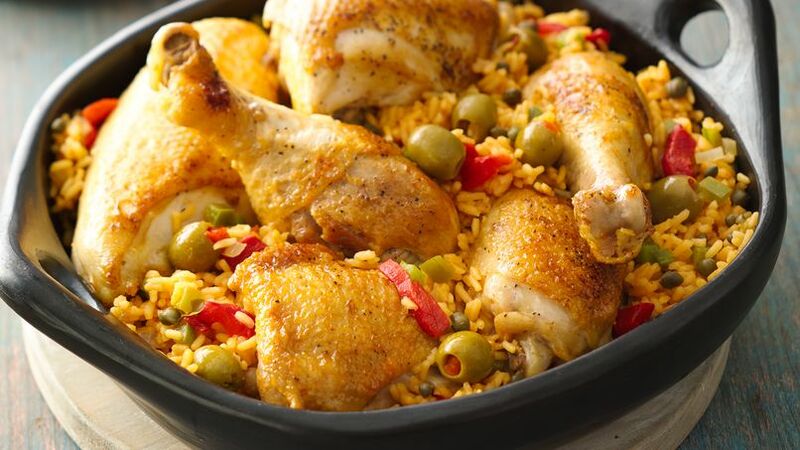 Arroz con Pollo is a traditional dish from the Latin American gastronomy with some variations from country to country. It's important to take into account that even if we use the same ingredients, it's prepared in different ways. 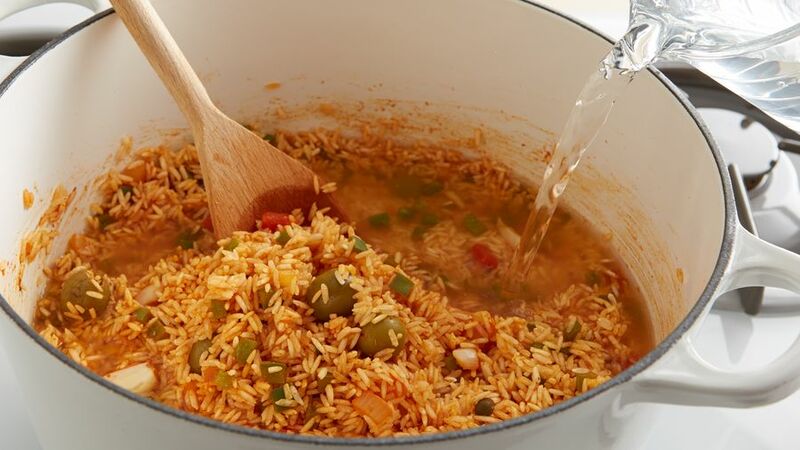 In Puerto Rico, for example, we make it combining rice and chicken in a caldero (cast aluminum pot), we season it with our famous sofrito, a sautéed mixture of onions, green peppers, garlic and other spices. This simple, but delicious, traditional dish is the preferred of most boricuas and the most cooked in Puerto Rican households. It is very popular because of its easy preparation and because there's no need to buy budget-buster ingredients. Don't let the Puerto Rican style title of this recipe fool you, since each family has its own version of the dish.